Apart from being one of the rare public spaces in downtown Baltimore, the McKeldin Fountain was also a designated Free Speech zone. 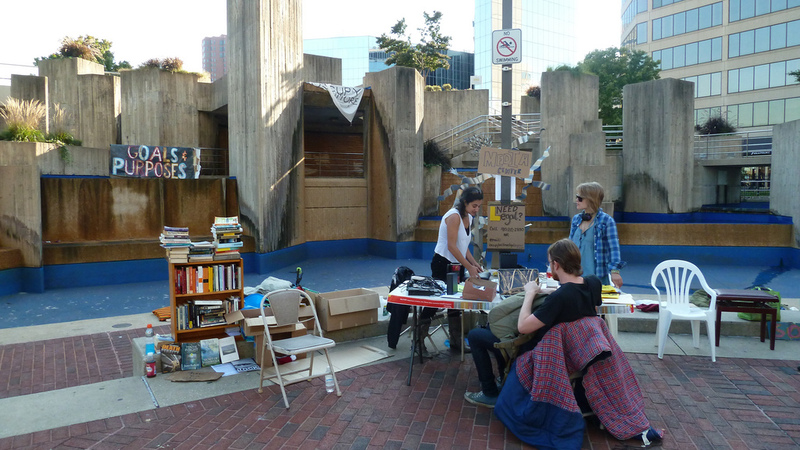 The story of the demolition of the McKeldin Fountain is an example of escalating privatization of free access to public spaces world-wide, a trend that continues to diminish access to full participation for ordinary people in everyday urban life. Nonument Group artists Lisa Moren, Neja Tomšič, Jaimes Mayhew and Martin Bricelj Baraga set to virtually revive the demolished fountain and allow users to relive the experience of standing in front of the fountain by viewing it through their device’s camera, and watch interviews with 18 people sharing stories from the McKeldin Fountain’s more than thirty years of existence, from tales of protest to personal memories. The McKeldin Fountain was designed by Thomas A. Todd, as part of a wider urbanistic solution to connect the city center and the harbor area of Baltimore. Symbolically designed to represent the branches of the Susquehanna River filling the Chesapeake Bay, the fountain was a transitory space: a space between a monument, a fountain and a park, a public space and a bridge. The design intertwined concrete blocks with water cascades (thus the Fountain got its name, ‘The Waterfall’). His plan reflected the colors of the fountain’s surroundings: the concrete grays of skyscrapers, the beige shades in line with buildings of the time, while the watery blues and greens visually connected the concrete business center to the harbor. The Fountain was designed as a walk-through park, but some considered it unusable. On the other hand, it became the city’s icon. It was a rare example of the use of brutalist aesthetics in public space design. Full of hidden passages, it was a magnificent background for mermaids or Otakon participants, and a unique polygon for parkour practicioners; as well as a hiding place for unwanted activities. After the opening in 1982, it was proclaimed as a city jewel, but the city increasingly considered it to be an eyesore that couldn’t be integrated into the renovation of the Inner Harbor. In 2013, on behalf of the Women In Black peace organization and with the support of the American Civil Liberties Union [ACLU], McKeldin Square became the City’s designated Free Speech zone after a ten-year court case. This designation made it easier for artists, performers and protesters to gather and exercise their right to free speech at the highly visible intersection of Pratt and Light Street in downtown Baltimore. Among others, it was the site of Occupy Baltimore in the fall of 2011, and the Black Lives Matter demonstrations. The story of demolition of the McKeldin Fountain is an example of escalating privatization of free access to public spaces world-wide, a trend that continues to diminish access to full participation for ordinary people in everyday urban life. After 2010, the Fountain was operational only sporadically. Its lighting, plants and general maintenance began to fall off, leading to the deterioration of its appearance. In 2011, trees intended to cut down on traffic noise in the Square were felled to make space for a car race. 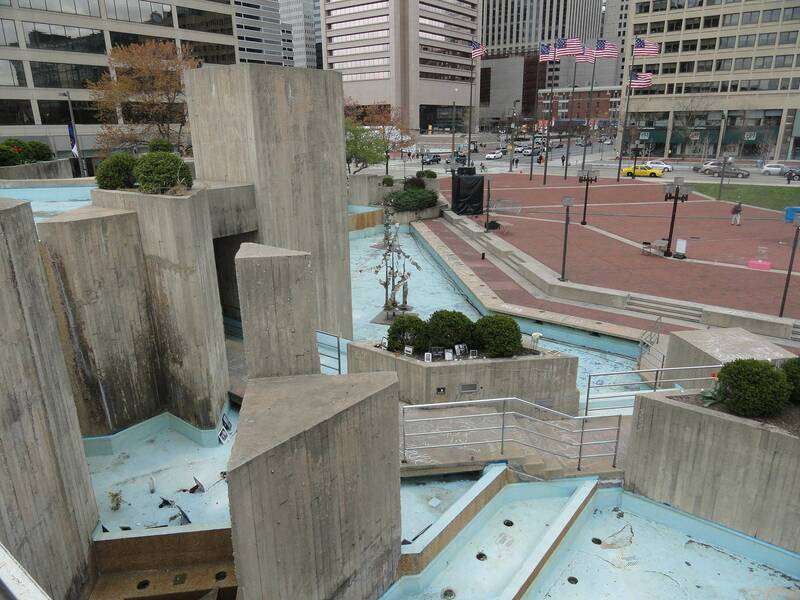 After several years of similar neglect, the Downtown Partnership of Baltimore led a campaign promoting the idea that the fountain was an eyesore and needed to be demolished. Its director Kirby Folwer had also supported the demolishing of the Mechanical Theatre, another iconic bruatlist building. He claimed that the fountain cost 400.000 dollars a year to maintain. While many City and private agencies and councils rejected the controversial idea of demolishing McKeldin Fountain, in the end only the Mayor’s Office was required to obtain the permission necessary to begin demolition. Between October 2016 and January 2017, the fountain was leveled, and was soon after replaced with a grassy field. Future plans for the site are unknown. Unlike familiar stone and bronze monuments, Nonument 01 uses GPS and augmented reality to memorialize the transitory nature of everyday experiences. Nonument 01::The McKeldin Fountain is a virtual memorial to the brutalist architectural fountain that once stood in Baltimore’s downtown Inner Harbor. When viewers hold up a tablet or smartphone like a protest sign at McKeldin Square, they reveal a full-scale, 3D, architecturally correct model of the controversial half-acre McKeldin Fountain. The viewer is then guided through 16 “Nonuments” of everyday life. Each Nonument tells the stories of 18 Baltimorians [including two pairs], showing their memories of the fountain through a multi-media environment, reminiscing on the history of its protests, performances and everyday urban experiences. The fountain may be viewed anywhere in the world, but viewers at the original site at McKeldin Square in Baltimore MD are given an audio tour by the artists. Viewers wander the animated waterways, including the infamous double waterfall. Sprinkled throughout the site are ‘memory artifacts’ guiding the viewer through a game-like experience. Walking through whispered chambers and tapping on artifacts trigger stories by Baltimore heroes, who reminisce on Occupy Baltimore, Women in Black and the Freddie Gray protests; women’s trans picnics; anime costume events; rappers, a former mayor; kids swimming; a marriage proposal, and an arrest in the Square. 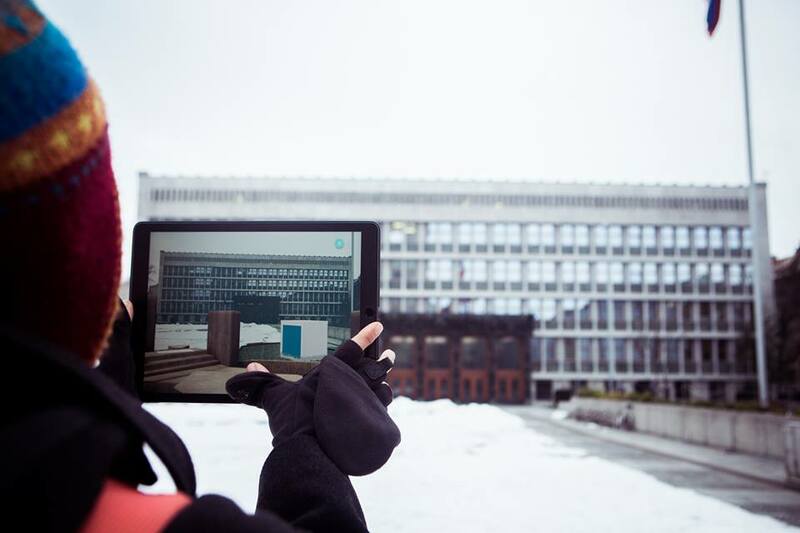 Nonument 01 is the first AR app of its kind that offers a large-scale 3D simulation of an architectural work using high quality rendering techniques typically only available in virtual reality and GPS location tools. The virtual memorial to the McKeldin Fountain was selected as Best Public Art 2018 by the Baltimore Mag. This project grateful for the generous support from the Saul Zaentz Innovation Fund in Film + Media at Johns Hopkins University. We are also grateful for support from The Andy Warhol Foundation for The Visual Arts, The Grit Fund, Baltimore Women and Tech, and the Imaging Research Center and CAHSS at UMBC. Special thanks to for the expertise of Audrey Ewall, Fred Scharmen, Mike Schector and the Saul Zaentz Incubation Team. We appreciate the dedicated support from Baltimore Visitors Center, D-Center and Maryland Art Place who support this project in so many flexible ways. Get the Nonument 01::McKeldin App from Google Play or App Store.